Half-Life 3 can wait, as far as I’m concerned. Half-Life 1, great. Half-Life 2 and its episodic content was even better. But that ship has sailed, and I can’t help but feel a pang of sympathy every time Valve’s Gabe Newell has to field questions about the long (non-?) gestating sequel - something he had to do again this week. Whether gamers can stomach it or not, Valve has changed, and Newell has bigger fish to fry. VR, and Valve’s partnership with HTC and the Vive is now front and center. 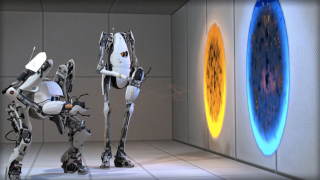 And forget Half-Life - there’s no better potential showcase for that renewed focus than Portal. The Valve boss took to Reddit last night for an AMA session, parrying the usual requests for more Half-Life content. “The number 3 must not be said,” quipped “Gaben” before setting the citizens of City 17 into another frenzy by teasing the potential of a return to the Half-Life universe. But, as an inside source speaking to Game Informer recently suggested, what would that Half-Life game even look like? Like the Star Wars sequels, surely not the mythical beast gamers have pre-fabricated in their heads over the past 12 years. With so many of the original Half-Life teams moved on to pastures new, the head crabs may be the same, but the spirit of the series would have been shot into the distance from the barrel of a Gravity Gun. Valve is a very different company now to when Half-Life 2 was conceived - it’s easy to forget but Steam, so ubiquitous to PC gamers these days, had to be coaxed onto computers initially by being the only way to (legally) play Half-Life 2. It’s now the money-spinning go-to digital gaming platform that all others strive to be. In IP terms, the company seems far more interested in mainlining addictive multiplayer titles into the veins of its fans. DOTA 2 is the gaming equivalent of a bottomless bag of Doritos, an endlessly tasty bite-size chunk of gaming, while the team-focused Left4Dead and Team Fortress titles again trade single player storytelling for infinite replayability. Valve’s investment in VR shows that, if it’s ever to go back to the single player adventures that Newell teases, that enveloping experience would have to be a part of it. But that’s a technology currently far better suited to the Portal universe than it possibly ever will be for Half-Life. It may predate the Vive by around nine years, but Portal seems almost custom-built to be retrofitted for virtual reality controls. The whole game set-up seems like a metaphor for the ongoing VR experiment itself, as you play a test subject trapped in a technologically-driven mouse maze. It’s a perfect match for Vive, a gaming device that’s at once the most freeing accessory ever paired to a computer - and simultaneously the most restrictive. For, by ungluing us from our desk chairs and giving us the freedom to walk around a room, you’re instantly wishing to take that extra step beyond the bounds of your 8 x 6 living room, to the digital horizon teased within the headset. Portal’s main mechanic - the gun which allows you to essentially teleport from location to location - mitigates the inherent limitations of the Valve. Want to take a look at that turret 30 digital feet away on the other side of a ravine (within the confines of your bedroom, or course)? No problem - place that portal a few feet away and step into the new location on the safe side of the chasm. VR still wrestles with the problem of movement - just look at the growing list of gadgets intended to fix it. It’s why that trip to Skyrim’s tundra’s in VR may be forever delayed. But Portal has a built in workaround. It’s a gimmick that still provides the awe of the VR spectacle too - that teleporter may be at the heart of your commuting dreams, but it’s never going to happen in your real-world lifetime. But with headset strapped on, the dream becomes a reality. It’s pure wish fulfillment, and it's something the company has even already experimented with, as the Portal universe and its characters made a brief appearance in the SteamVR demo reel. So, as much as I love the series, Half-Life can sit on the shelf for now. VR is the future, and Portal’s the game to teleport us into this brave new headset-driven world.